US Vice President Mike Pence in Tbilisi, Georgia with Prime Minister Georgia Giorgi Kvirikashvili. Photo Credit: Georgia PM Office. Nine years ago, on August 8, 2008, Russian military forces annexed the lands of its Eastern European neighbor, Georgia. For decades, Georgia has pursued European and Euro Atlantic aspirations in contrast to Russia. After a brief war with Georgian forces, Russia recognized two integral parts of Georgia, Abkhazia and South Ossetia, as independent states. These moves -were widely criticized in the international arena. Then President of France, Nicolas Sarkozy, played a crucial role in bringing the two sides to a cease fire agreement. However, even today, Russia continues to violate the post-war agreement and the unlawful annexation of Georgian lands. Most of the international community does not recognize the two so-called “states” — only Nauru and Venezuela, perhaps on a promise of reward from Russia. As the integral Georgian regions of Abkhazia and South Ossetia remain annexed by Russia, the new ruling party “Georgian Dream” follows the policy of peaceful reconciliation and confidence building. However, Russian military build-up and constant violation of the Cease Fire Agreement of 2008 makes resolution of the conflict implausible. Pro -Russian separatists have intensified efforts against ethnic Georgians, Georgian language schools have been shut down, ethnic Georgians have been forced to adopt Russian citizenship, and barbed wire fences built by separatists mark impromptu “borders.” Amid this tension, Russia continues to prevent international organizations, including the UN and the Organization for Security and Co-operation in Europe (OSCE), from sending peacekeeping missions to the affected regions. It is indisputable that the NATO member states with the US leadership remain strict in its position of supporting Georgia’s sovereignty and territorial integrity. U.S. Vice President Mike Pence’s recent visit to Georgia was a clear illustration of high-level support from the United States. During his trip, Pence also made appearances in Estonia and Montenegro. It is significant that along with visiting NATO allies, Pence visited a NATO aspirant state — Georgia. With that, he sent a clear signal to Russia that Georgia’s Western path is irreversible and no foreign power can change it. While in Georgia, Pence expressed full support toward Georgia’s territorial integrity. 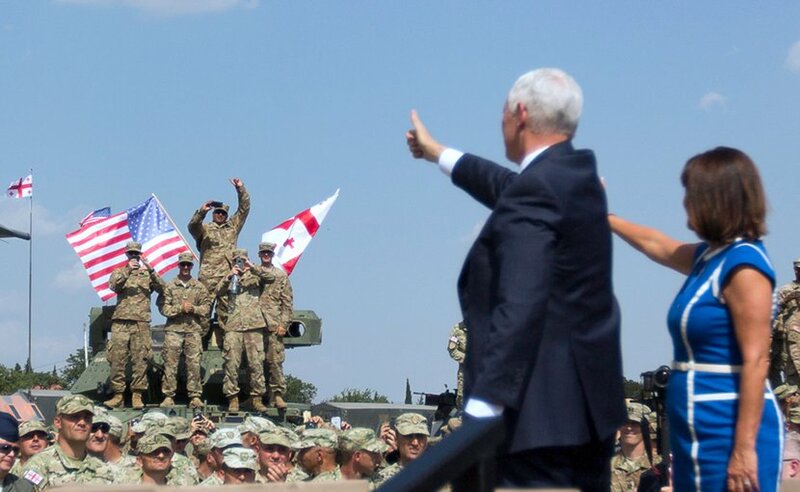 Pence later addressed American and Georgian troops at Exercise Noble Partner, held in the framework of the strategic partnership between NATO and Georgia. Pence’s visit took place as U.S. President Donald Trump signed the Russia Sanctions Bill, which puts additional sanctions on Russia in response to its unlawful interventions — particularly in Ukraine, Georgia, and meddling in the US elections. Pence’s strong message of resistance to Russian aggression in Eastern Europe, timed with Trump’s signature on the sanctions bill, truly angered Putin. After he returned from his Siberian vacation, Putin visited the Georgian breakaway region of Abkhazia in order to reiterate his unlawful commitment to recognizing it as an independent state. However, his attempts to split the country will not be tolerated in Western capitals. Georgia calmly cements itself as a modern European state and beacon of democracy in the region. With over 70% of Georgians supporting EU and NATO integration, Georgia’s Western future and peaceful reconciliation with breakaway regions have no alternative. *The Georgian Youth Network in the United States helps young Georgians to stay connected to each other both in USA and Georgia. The Network gives visitors an opportunity to meticulously observe the relevant issues related to Georgia and follow the students who study abroad in the United States. The main aspirations of the network are the promotion of a Georgian culture in the United States and the guidance for the young Georgian students who plan to study abroad.